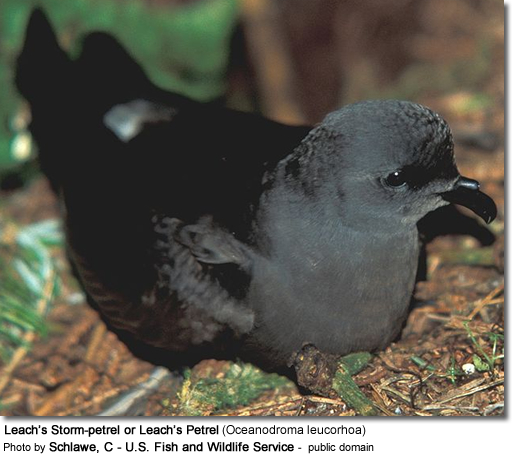 The Leach's Storm-petrel or Leach's Petrel (Oceanodroma leucorhoa) is a small seabird of the tubenose family. It is named after the British zoologist William Elford Leach. It breeds on inaccessible islands in the colder northern areas of the Atlantic and Pacific. It nests in colonies close to the sea in well concealed areas such as rock crevices, shallow burrows or even logs. It lays a single white egg which often has a faint ring of spots at the large end. This storm-petrel is strictly nocturnal at the breeding sites to avoid predation by gulls and skuas, and will even avoid coming to land on clear moonlit nights. The largest colony of Leach's Storm-petrels can be found on Baccalieu Island of eastern Canada, an ecological reserve with more than 3 million pairs of the bird. The Leach's Petrel is a small bird at 18-21 cm in length with a 43-48 cm wingspan, but is distinctly larger than the European Storm-petrel, which it superficially resembles with its dark plumage and white rump. It has a fluttering flight, and patters on the water surface as it picks planktonic food items from the ocean surface. It can be distinguished from the European Storm-petrel and the Wilson's Storm-petrel by its larger size, forked tail, different rump pattern and flight behaviour. Some north-eastern Pacific Leach's Petrels show all-dark rumps. Like most petrels, its walking ability is limited to a short shuffle to the burrow. One interesting aspect of the bird is that contrary to most species, this bird gains telomere growth as they grow older. Telomere shortening in cell division limits the maximum lifespan of most other species. 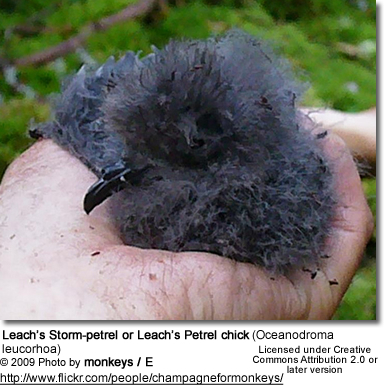 The lifespan of the Leach's Petrel is therefore theoretically limitless. It is strictly pelagic outside the breeding season, and this, together with its remote breeding sites, makes Leach's Petrel a difficult bird to see from land. Only in storms might this species be pushed into headlands. 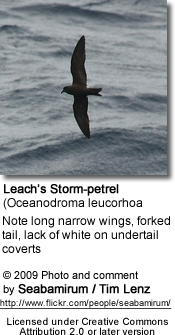 Unlike Storm-petrel, it does not follow ships. In Europe, the best chance of seeing this species is in September in Liverpool Bay between north Wales and England. Strong north-westerlies funnel migrating Leach's Petrels into this bay. British ornithologists Robert Atkinson and John Ainslie observed the communities of Leach's Petrel on the remote Scottish islands of North Rona between the 16 July and 12 August 1936, and on Sula Sgeir between the 3 and 4 August 1939. Lifespan for this bird is unusually long for a bird of such rather small size, with an average of 20 years and a maximum recorded lifespan of 36 years. In 2003, Haussmann et al. found that the bird's telomeres lengthen with age, the only known example to date of such a phenomenon. It is rather likely, however, that this phenomenon also occurs in other members of the Procellariiformes, which all have a rather long lifespan compared to their size.